Well, actually it started with sleeveless evening gowns. No-one worries about underarm hair when other people can’t see it, and until the 1910s women’s fashion had concealed that particularly racy area of the body from the foul gaze of men (and, more pertinently, other women). Nary a one was bothered by it – it was ignored, disregarded, a private family matter, until along came the sleeveless evening gown, and suddenly hairy pits mattered rather more than once they had. Thus it was that the May 1915 issue of Harper’s Bazaar, in running an advertisement that dared to mention ‘objectionable hair’ (what appallingly direct words. Bunter, ready the fainting couch!) and how to effect its removal, began – or perhaps resumed – a trend which persists to this day. The advertisement was for depilatory powder, but soon enough razors aimed at women were appearing on the market and women the world over were learning that, to avoid being an embarrassment, they were obliged to tidy up their unsightly areas (quiet at the back). Although – wait a minute. What was it that the advert said? 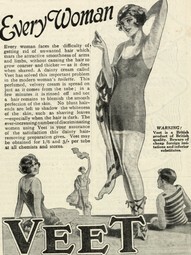 ‘Summer Dress and Modern Dancing combine to make necessary the removal of objectionable hair’. So it was that modern sinful jazz that started it! I should have known. As my character Ambrose Meredith will be happy to tell you, nothing good ever came of jazz. So much for underarm hair – but what about the legs? A much more frustrating task altogether, as any woman will tell you, and yet for many years it was less of a concern than the aforementioned unmentionable underarm hair. This was partly due to hemlines. In the twenties skirts went up, but not as quickly as many people imagine they did: it wasn’t until 1925 that hemlines rose from the lower calf to just above the knee, and they went back down to almost ankle length in 1929 and remained low throughout the thirties. With legs by no means as much on show as is frequently thought to be the case, it is not surprising that leg shaving was of a somewhat sporadic nature until the 1940s, when skirts rose permanently and women became far more aware that all that hair pressed against one’s stockings does look somewhat inelegant. That said, women of the twenties did remove leg hair – just not with such regularity as we do these days. But regardless of whether the hair they wished to remove were on their shins or under their arms, they had a remarkable number and variety of products available to achieve the goal. 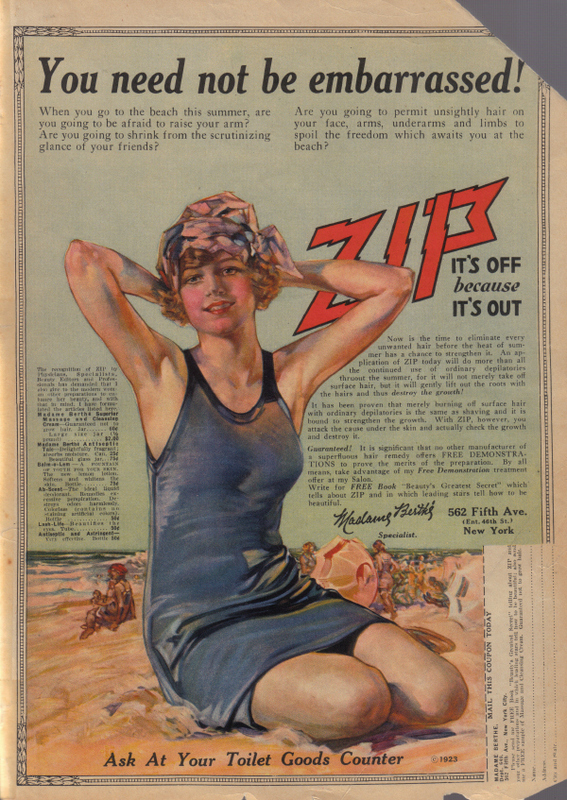 This was the first product for hair removal that was given widespread advertising, as we have seen above. 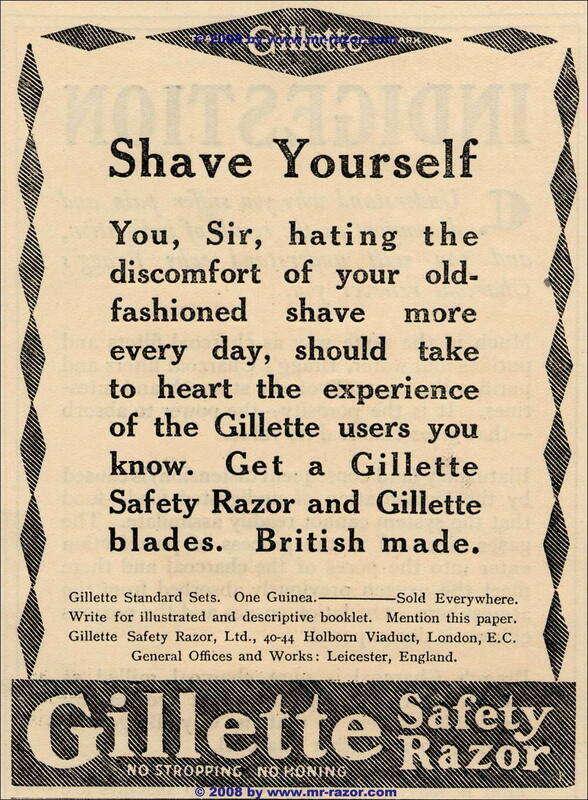 There was many sorts, including Zip, produced in the States, which helped you get rid of ‘offending hairs’ on your arms and limbs, and which makes a brief appearance in a short story I’ve written on the subject of shaving. There was also depilatory cream, such as the one manufactured by Veet (established in England in 1922 and still going strong) or Ashes of Roses, sold around the world. Advertised as easier, less painful and less unsightly than razors, depilatory creams proved immensely popular with the fashion-conscious of almost every class. Gillette were the champions of women’s shaving, calling it the ‘safe and sanitary way to the smooth underarm demanded by both good grooming and good dressing’ (no manipulation there, then). 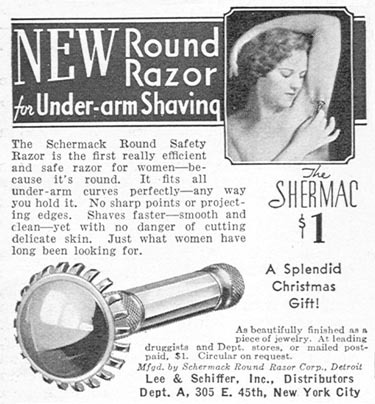 Men’s razors were available to women (though this advert suggests that Gillette razors were a guinea a time, so perhaps not the most accessible implements), but companies were not backwards in coming forward with feminine versions; for example, Gillette’s Milady Décolettée, especially designed for a more comfortable underarm shave (translation: it’s small). 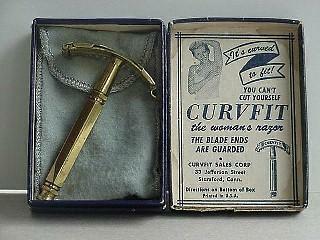 Here is a lovely collection of photographs of a Milady razor set. That said, shaving was discouraged (albeit mostly by manufacturers of depilatories) as leaving ‘unsightly stubble’, which was presumably not up to the standards demanded by good grooming and good dressing. Oh goodness, yes. Scour away that hair with a pumice stone, girls. That’ll make your underarms look pretty. Here’s a charming blog about beauty in the 20th century, in which you can see for yourself the implement known as The Tweaker. It is slightly less alarming than it looks (and sounds), though its method appears to be hauling the hairs out by the roots. Yowch. If you think any of the above sound bad, imagine using this: the Cornell Tube, an x-ray machine. Removes hair and acne, adds cancer. Lovely. The main thing I have observed in the course of this investigation into hair removal is the insistence on the embarrassment women must face if they appear with one stray strand of hair in an unseemly part of their body. Such brow-beating, image-conscious sentiments are, of course, still with us in the ‘modern’ age, albeit often rather subtler in form, but it is nonetheless intriguing to see how early into the history of the ‘body beautiful’ these pressures on women to be physically perfect began to emerge in advertising material. This post was written to the tune of Dvorak’s Ninth Symphony, Baltimore Symphony Orchestra and Marin Alsop conducting. I’ve been looking forward to listening to that all day and it was certainly worth the wait – best recording of the New World Symphony I’ve heard, and I’ve heard a few. Available on Naxos for a ridiculously low price. Totally agree. The trends in the late 1910s and early 1920s really do trace themselves back to Harper’s with a beautiful history. Your prose is terrific, educational and entertaining. I have a literary blog, and I post about the 20s as well. Keep writing! Those bathing beauties are exactly what I need on the roof of my Art Deco house! Figures or artwork? I can’t manage the former but might be able to do the latter!